Deck Chair with included webbing and reinforcement rope. New design! 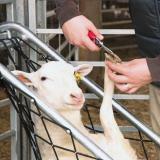 Premier's Deck Chair holds sheep reliably in a relaxed position which allows the use of both hands to trim feet, tag ears, examine and medicate. Restrains heavily pregnant ewes without injury. Galvanized steel pipe with elastic webbing. Can support large, adult sheep and goats (without horns). Adjustable width for all sizes. Maximum width is 16 inches. Minimum width is 10 inches. Bottom "legs" are 14 inches. 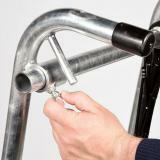 Can be folded flat for easy storage and transporting with some disassembly. Save yourself the backache of trying to hold the animal and work on them at the same time. By using a deck chair, you can use both hands for working on the animal. 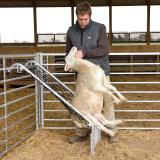 Restrain pregnant ewes without injury to them. It also allows you to walk away for more medicine or tools knowing your animal is safely restrained. A thick weave of elastic shock cord has replaced the string net we used previously. The elastic web springs back into place when the ewe leaves the chair reducing the risk of entanglement. 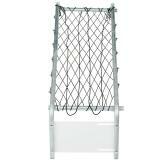 The webbing quickly hooks over built-in rivets for easy replacement. 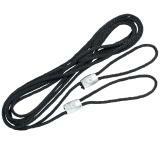 Included support rope can be used for heavy animals to prevent over-stretching. This simple device prevents the animal’s hind legs from getting caught in the mesh. On occasion we’ve had to chase down a ewe that’s made off with our deck chair because of this very reason—not often, but it has happened. When using our original chair, a wrench was needed to make side-to-side adjustments. These nuts have been replaced with finger-friendly wing bolts. Kick-plate adjusts via the same method. See Deck Chair instructions above for additional information. Best location is in the corner of a small pen, as this allows catching the animal with the least effort. 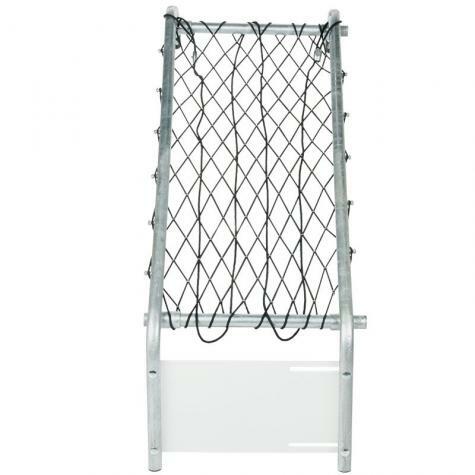 Drop the top of the chair over the gate or fence at a 45 degree angle. Catch the sheep by the head. Back the sheep into the chair. As the back legs hit the bottom crossbar, the rump (and most of the animal's weight) will fall into the webbing. 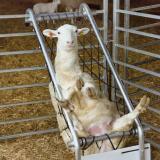 Take care not to catch the rear legs in the 2 vertical chair legs. Complete the process by lifting the head upwards into the sitting position. With one hand, tip the chair forward with the sheep inside it. Allow the animal to fall out onto its feet. Hang onto the chair or you may be chasing the animal/chair combination around the pen. 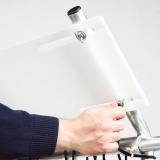 The tighter the adjustable tubular sidebars clamp the animal, the more secure the hold. If a typically-sized animal in your flock is too loose in the chair, loosen the clamps and slide the side bars closer together. Does not work well with horned animals. Their horns may become entangled with the webbing. Note: Deck Chair Replacement Webbing (#807515) DOES NOT fit our Old Deck Chair (#807500). Superior to standard trimmers on rams and billies. Long handles provide tremendous leverage to cut easily through tough, hard hooves. Makes the job of trimming hooves less of a chore. When we trimmed the hooves of our ram flock (Ile de France cross rams and hair rams) we used the deck chair to make the job a little easier, the hardest part was catching the rams. The chair held them and we had no escapes. Adjusting between each sheep can be a hassle (we typically skip this step) but overall it is a back saver… Read More » compared to sitting the sheep/goat on their hind end and trimming. The reinforcement rope is not optional for this new style chair. If you don't use one (chair didn't come with one when originally purchased), the sheep rumps drop too far down into the seat, overstretching the elastic webbing. The webbing then starts tearing and fraying easily. I don't like how the number of spaces along the side of the webbing don't seem to match the number of tabs to hook them over. I had to undo and redo a couple of times to get the netting mounted evenly. The little metal rings holding the webbing into its diamond pattern are always sliding out of position with the weight of the sheep, but are difficult to slide back into position. I don't like the kick plate that has been added to prevent the sheep from catching its leg under a chair leg. It adds weight to the chair and it makes adjusting the chair width even more time consuming, plus, it restricts how wide the chair can be spread. And the sharp edges have gouged me in the legs a couple of times when a sheep hangs up a bit when dumping them out and the chair bangs against you. I took it off. Used a chair for years without the kick panel, with no problems--you just check to make sure the sheep's legs aren't sticking around them before you tip. The big wing nuts are a nice change from the old plain nuts requiring a wrench. The deeper seat of the chair helps keep a sheep immobile a bit better, but a sheep that decides to struggle is still going to struggle, and the sheep catch their hocks under the bottom cross bar a lot more frequently and manage to get a leg through the stretchy webbing more often, than with the old cotton netting, which had a shallower seat. But still, the chair works and is a boon when you need to tip a sheep for work. I highly recommend this product. It was easy to tip the Sheep into it. And they actually seem to enjoy sitting there while I did their pedicure. I thought this was the answer to my hoof trimming problems, but it really isn't. It helps alleviate back pain because you are not bending over as much. Perhaps it is the personality of the sheep that I own, but once I would get them in the chair, which was struggle, they would always kick, struggle, twist and turn and get a back leg through the webbing or a front leg under the frame. Lifting the chair to get them out is very difficult and with one sheep, who was struggling and flailing her legs, she lurched up and out and hit me in the face with her head. I have owned it since May 2017, always stored it inside the barn, hung up to keep it in good shape. 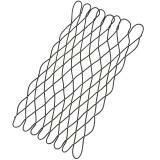 I have used it 3-4 times with 2-6 sheep each time and today, the webbing broke in a few spots rendering it useless. 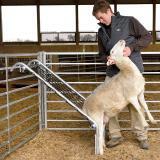 Using the included Reinforcement Rope will extend the life the deck chair, especially when raising large and heavy sheep. 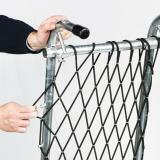 This rope prevents the mesh from over-stretching and becoming damaged. Making adjustments to the side rails will limit the animal's ability to twist and turn. This is important when working with different sized animals.